WOODRIDGE, Ill. – Gerber, a leader in plumbing products for more than 85 years, has added another more decorative option to its Blazeâ Collection of bathroom products – the Blaze Concealed Trapway One-Piece Toilet (21-187) and the Blaze Undercounter Rectangular Bathroom Sink (13-760). The new Blaze toilet fosters the trend of concealed trapway (CT) design. This feature gives the base of the toilet a smooth, sleek and almost tailored look that is easy to clean and maintain – very appealing traits for designers, builders and homeowners. The one-piece configuration adds even more to those design and maintenance attributes. The Blaze undercounter sink measures 19-5/8 x 16-5/8 for outer dimensions, with inner dimensions of 17” x 14”. The rectangular shape and interior style lines of the bowl, follow design cues from casual contemporary design trends. It features a concealed front overflow and is ADA compliant. 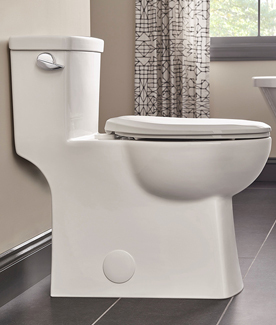 The Blaze CT One-Piece toilet stands at 17 inches high (ADA compliant) and features a compact elongated bowl for added comfort. According to industry studies, the one-piece toilet market continues to grow at a rapid rate, positing double digit increase over the last three years. Those results are in part due to the desire of homeowners to add more design into any bathroom environment, while maximizing space. This Blaze model with its compact elongated bowl is a great solution to fit in virtually any bathroom regardless of size. The toilet flushes at 1.28 gallons per flush, helping homeowners save more than 20 percent in water usage over conventional toilets. Yet, even at such a conservative rate, homeowners and specifiers can rely on a powerful flush. The Blaze CT One-Piece is equipped with the new PowerClean flush system, which has a MaP score of 1000 grams and delivers 50 percent more drain line carry than the national code requires. Holding true to Gerber’s reputation of outstanding, reliable performance, the Blaze CT One-Piece toilet includes features such as a 3” flush valve for maximum water flow and flushing power, a large 2’ fully glazed trapway for clog-free waste removal, a Fluidmasterâ 400A fill valve and Fluidmaster flapper, and extra-large dual fed siphon jets to increase the force of the flush. For more information about Gerber and its range of products, visit gerberonline.com.